Home > Planning Your Speech > Paid or Unpaid Speeches? Though every speech you give should be written, rehearsed, and delivered with a high degree of professionalism, the reality is that paid speeches often wind up as much different than unpaid ones. Consequently, how you approach various aspects of your next speech may be directly determined by whether or not you’re receiving monetary gains. In the paragraphs below, we’ll explore some of the elements of all types of speeches and how and why the issue of payment can play a factor in each. Paid Speeches - Let’s face it… time is money. And if you’re being paid for your time, you’re going to try to speak as long as you can on the topic at hand. That being said, you may not have a great deal of freedom on speech length if you’re receiving remuneration for your public speaking skills. For instance, if you’re being paid to speak for only a half hour, you’re locked into that timeframe, even if you feel your topic warrants additional minutes. Similarly, if you’re finished with your speech too early, the person or organisation paying you may feel “gypped”. Unpaid Speeches - Just because a speech is unpaid doesn’t mean it’s going to be short… but that’s often the case. Wedding speeches, memorial service speeches, retirement speeches… they are all delivered “gratis”, but are typically very succinct. Paid Speeches - Unless you’ve been given carte blanche to come up with a topic, you’ll most likely be given specific guidelines by your benefactors. And in some cases (such as if you’re the hired spokesperson for a company or political candidate), your words may be written and edited by someone else. Unpaid Speeches - Typically, if you’re not being paid for a speech, you have a bit more freedom when it comes to subject input. Certainly, you might be given a broad topic idea, but you’ll frequently enjoy significant leeway when it comes to the specifics of your speech. Paid Speeches - If an individual, group, or company is paying you to speak at an event, it’s in their best interest to make certain the speech is well-attended. Fortunately, though, you won’t be expected to market your speech; instead, you can simply show up, do your job, collect your fee, and leave. Unpaid Speeches - In the case of an unpaid speech unrelated to a celebration (such as an anniversary or birthday), the onus may fall squarely upon your shoulders to encourage audience members to attend your talk. For example, if you have a passion for antique tables and are simply itching to introduce other collectors and hobbyists to this niche collecting focus, you could easily find yourself doing all the publicity and getting only a handful of listeners for your efforts. 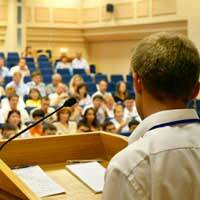 Paid Speeches - If you’re paid to give a talk on a particular subject area, you will typically be introduced as an “expert” in some way. This is the reason that the majority of casual speeches are unpaid; after all, plenty of people know a little… but not everyone has the credentials to wow an audience or land a public speaking gig. Unpaid Speeches - As mentioned above, your credentials are not necessarily going to be the deciding factor when you’re being considered for an unpaid public speaking position. In the end, it’s important to recognise that paid and unpaid speeches carry with them different expectations; however, no matter which best describes your next speech experience, you owe it to yourself, the event organisers, and your listeners to do the best job possible.